Our greatest suffering is that we do not feel complete as we are. Right here, right now! We have been trained to reject our distinctiveness. We live in a prison; a cage of guilt, anxiety and worthlessness, believing that we are never ‘good enough‘ – just as we are. These prison walls have been created by the conditioned rules given to you by parents, your teachers and the media. This book will enable you to dismantle these walls, stepping into the freedom, vitality and Spiritedness that is your birth-right. To let go of being a victim in the face of conflict and threat. Discover the great power and joy that lies beneath your self-doubt. To no longer be a slave to the conditioned rules of class and culture. To reclaim the power and confidence given away to others. To find happiness and love from within, rather than from external sources. To choose to risk more, than avoidance. To let go of the noose of guilt and performance anxiety, which society has placed around your neck. To move from the hell of wanting to be loved, to the heaven of loving yourself for no reason! Join me now in this incredible journey. The book is available in major book stores in South Africa, otherwise buy it below from Amazon Kindle. Loving the book! A lot of themes I think a lot about and track in interactions. Your framing of it is unique and powerful. Over the years my appetite for self-help books has waned in direct proportion to their unhelpfulness. 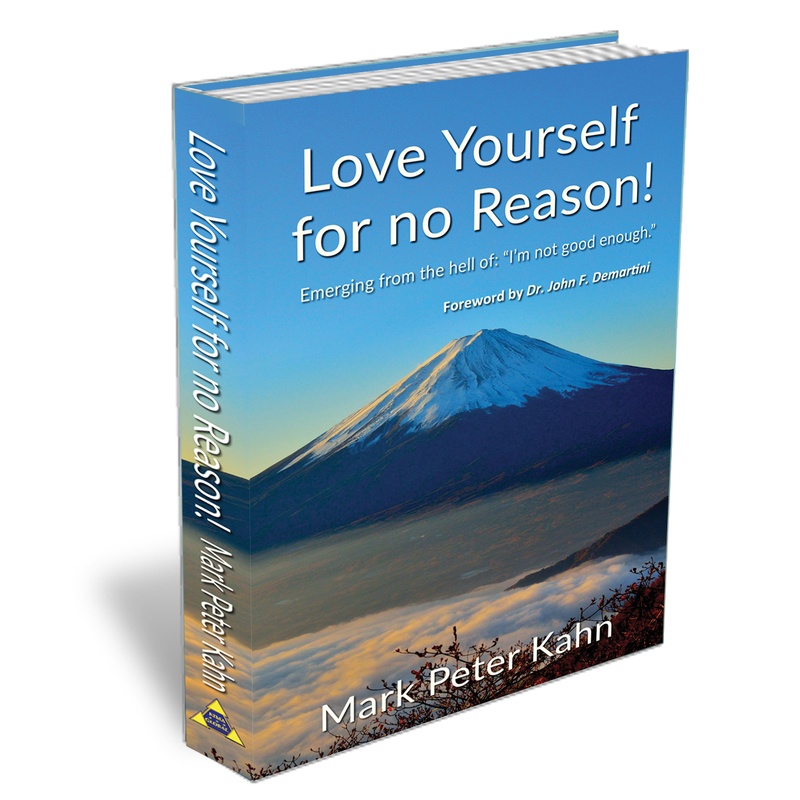 Under invitation I sat at my kitchen counter and started to read Mark Peter Kahn’s Love yourself for no reason. I noticed I wanted to read on; my thoughts and feelings were stimulated, stirred and more significantly, stilled. The substance of this book lies in the author uniting a trilogy of decades of personal processing, innumerable hours of working with others, alongside years of rigorous research. It is in the alchemy of Mark’s personal journey, his keen observation of others and passion for experimentation and exploration that Love yourself for no reason has been forged. The author expresses a united voice of journeyman, facilitator and scientist, creating a book that is personal with public reach, a work that in its witnessing shows the way and literature that offers a recipe you can taste. Love yourself for no reason offers a diagnostic truthfulness that creates resonance with the reader. The book illustrates a deep appreciation of complexity avoiding a superficial reductionistic approach. And its ultimate intrigue and success rests in the presentation of Love without reason. Natalie Uren. Author of: The Purple Egg & co-author of Food does not make you fat. Self-love. It’s a magical power. As a therapist of many years I’ve been witness to the results that self-love can bring in completely changing a person’s life around. In Love yourself for no reason, Mark Peter Kahn thoughtfully dispels the myth that the way to feel good is to have good things happen to us. Instead he shows the reader that feeling good comes from an internal power, the power of love. He discusses how much of the time we disconnec from our internal power, evidenced by the self-sabotaging ways we think, our need for perfection and our fear of being judged. In this deeply compelling book Mark Peter Kahn looks at the difference between Acquired Self-Esteem, that which we learn through approval, and Original Self-esteem which is our authentic pure consciousness – this is when we are in flow when we are connected and empowered. There are a number of very helpful techniques and practices designed to aid the reader in letting go of their Acquired Self-Esteem and to be able to begin finding their internal power by connecting with their Original Self-esteem. The power of love. A well written, easy to follow yet thought-provoking book that you will want to read more than once! Marlene Rose Shaw. Author of: Out of Fear Into Love: Live doesn't have to be a struggle. Love yourself for no reason is a practical and inspiring book written with insight and wisdom. Clinical psychologist Mark Peter Kahn’s book will be life changing for anyone suffering from Self-Esteem issues. The book offers empowering help for those living in the hell of: “I’m not good enough.” With unique techniques, strategies and meditations, the book provides the answers to healing your pain and learning to “activate love” and internal power that will transform your life. Lindsey Sanderson. Former copy editor of The Star Newspaper and short story author.